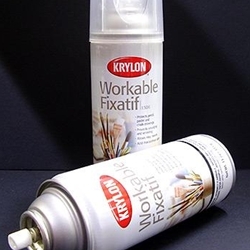 FineArtStore offers a well rounded assortment of artist spray fixatives including Krylon fixative and clear sprays, Perfix from Daler Rowney, Senneliers D’Artginy, Latour Fixative and Delacroix Fixative. We also offer Lascaux Fixative from Switzerland. For artists that prefer a pump spray we stock Spectrafix for pastel work.